커피, 케이크, 인터넷, 좋은 책, 시원한 곳. 좋다! 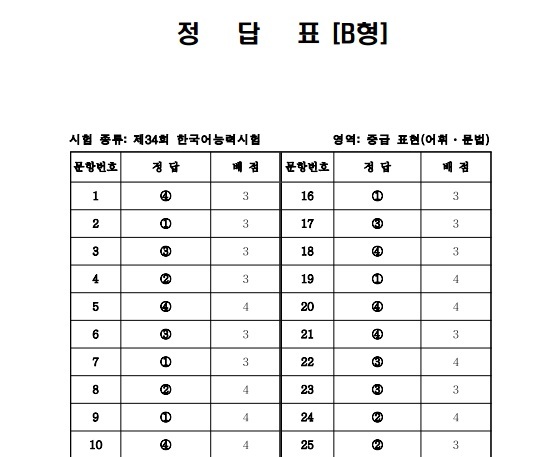 아마 한국어 능력시험 준비한것 때문에… 그리고 6일간 내내 회사에서 계속 일해야 해서 너무 피곤해나보다. 피곤해서 마음이 약해졌나보다. 오늘 괜찮아졌다. 회사 입할 때 부터 처음으로 쉬는 날 때 행복한다. 원래 쉬는 날 싫었다. 오늘 쉴 수 있어서 기분이 좋아지고 마음도 괜찮는 것 같다. 게다가 오늘 좋은 곳에서 글을 편하게 쓸 수 있어서 좋았다. 기분이 좋아서 자신감와 용기도 생겼나보다. 오늘 혹시 계획대로 정리 할 수 있을까? 암튼 해보고 싶다. Thinking about it, I guess I was just too tired the last couple of days that’s why my mood was bad. I was sleep deprived while cramming for TOPIK. I also spent a couple of nights in the office. On top of that I’ve been working for 6 straight days. I finally get to sleep comfortably last night because I don’t have to go to the office today. And for the first time since I started working in our company I was happy that it’s my rest day. I finally don’t have to dress-up and commute. I finally don’t have to talk to clients. I finally can do what I want (keep up with my Facebook, blog and emails more than anything else). I woke up feeling better despite the scorching summer heat. 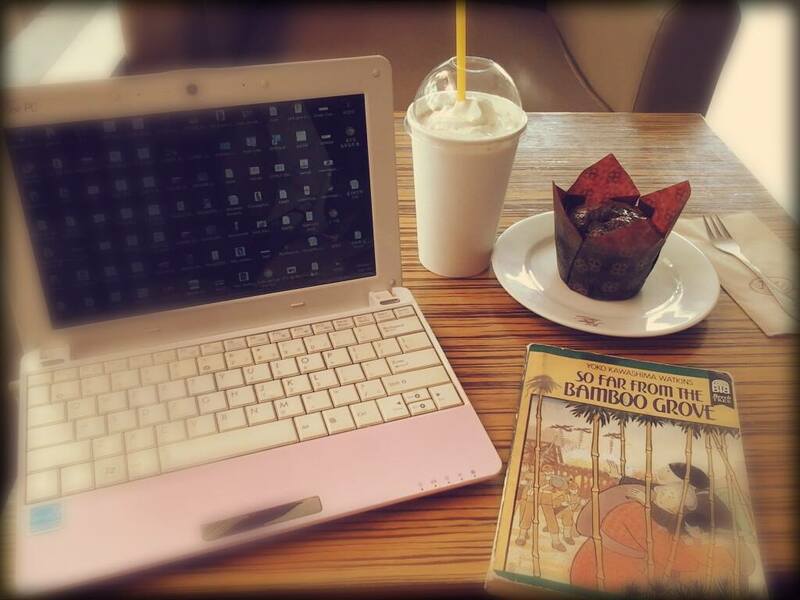 To escape from the heat, I went to a nearby coffe shop with my laptop, tablet and book in tow. And I felt happy. Being able to comfortably rest like this today and write to my heart’s content makes me happy. 만나서 정말 반갑다~ 다음에 너의 살고 있는 곳에 갈테니까 그 때 다시 만나자! I woke up this morning feeling a little weak. I was so stressed preparing for TOPIK that I’ve been deprived from sleep for quite a while now. After taking both beginner and intermediate exam yesterday, I went to sleep earlier than usual because I was physically and mentally exhausted. I really should have listened to everyone who adviced against me taking the beginner TOPIK. It was so easy, it didn’t feel like I was taking an exam. The intermediate exam was so-so. I don’t know if my skills have just improved or I was just lucky that the 34th intermediate was easier than some previous papers. If I do pass intermediate TOPIK, I’d definitely give myself a pat on the back for passing it without taking any formal lesson. Learning a foreign language on your own from the very beginning is not an easy task. 어젯밤에 많이 올어서 기분이 좀 가벼워졌다. 그래도 기분이 좋아지지 않다. 오늘 다시 외럽고 다뜻함을 찾고 싶었다. 그리고 기분이 안좋아서 많이 먹었다. 아무리 먹어도 기분이 풀어지지 않았다. I was no longer angry and my heart felt lighter because I get to cry a lot last night. But still I’m not okay. I’m not angry anymore. I was sad. Again I felt alone. Seeing other people spending time with their loved ones, family or friends makes me jealous and sad. Work was not any better either. Same irrational clients phoning in. I also ate and spend a lot on food because nothing I ate makes me feel good. And I just ended up being more depressed because I ate a lot. Today, I failed again. I was not happy at all. 일어날 때부터 기분이 안좋았다. 출근할 때부터 회사 일할 때까지 생각 많이 했다. 다시 울지 않을 줄 알았는데 오늘 다시 울었다. 다 다시 떠올리고 마음이 아퍼졌다. 그리고 화가 났다. 너무 많이 화가 났다. 그 사람한테… 내 자신한테. 너무 너무 답답해서 밖에 나가고 싶고 소리를 치고 싶다! I thought I was already okay that’s why I took this challenge. I guess I’m still not. I woke not feeling okay and as I go to work all I did was think think and think. I suppressed my tears as hard as I can. I was angry Very angry. Work was not good either. I was in midshift and usually there’s not much work during those time. I often take it as a time for me to rest and destress. But for some reasons, work was being cruel as well. Irrational clients phone in one after another making me angier. I ate a lot today but none of the foods I ate made me feel better. In fact it made me feel worse. I came home seeing my mom and aunt’s happy faces. They finally had our main door repaired and they both seem happy about it. I thought, “My family’s happiness today is my own happiness as well.” I was planning to think of it that way and end the day but merely 10 seconds have passed and I found myself crying crazily the moment I hit my bed. It felt as if the anger pent up inside of me the entire day I was trying to suppress my tears. I cried and cried and cried. I took a shower but the tears won’t stop. I tried watching dramas but they were also sad so it doesn’t help. I remember crying myself to sleep again. Just when I thought I’m no longer going to cry… Just when I thought I’m now okay… It’s all a cycle… it just doesn’t seem to end. Today I failed. I’m not happy. Not at all. 한국에 대한 소설을 읽기 시작했다 한글으로 쓴 책이 아니라도. 읽다가 그 사람이 다시 떠올랐다. 한국의 역사를 어떻게 생각할 지 궁금하나보다. 읽다가 그 사람 계속 떠올리고 떠올랐다. 떠올리면서 속었던 내가 다시 싫어졌다. 또 자책하나보다. 싫다. 싫다. 싫다. 혹시 난 너무 너무 빨리 했냐? 그래서 빨리 정리해야지! 근데 아직도 고민한다. 그것이 진짜 좋을까? 할 수 있을까? 견딜 수 있을까? 그런데 어제 한국어 능력시험 정답표를 나온다는 소식을 들어서 오늘 확인해봤다. 확인해 봤더니 점수 좋을 것 같다. 쓰기는 잘 하지 않아도, 다시 실패하기도 해도 이번에 내 답을 다 기억해서 설렜어. 지난 번에 하나도 기억을 못했잖아. 진난 번에 시럼볼 때 많은 것을 알아 못 들었잖아. 이 설려는 마음이 행복이라고 생각했다. Not wanting to look at any Hangeul for the meantime after cramming for TOPIK for the past few days, I started reading an English novel Yoko Kawashima Watkins’ So Far From The Bamboo Grove. Although not in Korean, it was about Korea during World War II. And once again, I started thinking about him. We once talked about Korean history. I was curious of what he thinks about the book. It started that way until I can no longer stop my flow of thoughts and it went on and on and on and on almost ruining my day. Was I going too fast? I started watching Korean dramas again. Then I started poring over my Korean books. And now a novel. Maybe I should slow down a bit? Anyway, the 34th TOPIK answer sheets were the saving grace of the day. I heard from Meloncreme that the answer sheets were already out so I excitedly downloaded them. I’ve taken TOPIK a number of times and I’ve never checked the anwer sheets because there’s no way I can remember what my answers guesses were. But this time it’s different. I was so excited to check things out because I think I can remember my answers this time. 오늘은 잠깐 우울한 느낌 또 느꼈다. 나랑 같이 있고 싶은 사람이 없다고 생각했다. 나는 왜 애정같은 걸 필사적으로 찾아보고 있냐? 나는 왜 좋아하는 사람을, 친구들을 그렇게 붙잡고 싶냐? 그리고 또 안좋은 생각 했다. 예전에 받았던 다뜻함 그리워졌다. 근데 의심했다. 그 다뜻함이 진짜 다뜻함인가 그냥 습관인가? 자기가 절망적인 사람이 된다고 생각하기 전에 Angeli 씨랑 만날 약속 생겼다. 기분이 풀렸다. 만나기 전에 회사에서 같이 일하는 동료들이 장난쳐서 내가 웃게 만들었다. 그리고 퇴근한 후에 좋은 마사지를 받았다. 그리고 제일 좋은 것은 Angeli씨를 만나는 것이었다. 그 친구와 늦게까지 수다를 떨었다. 난 행복한다. 그리고 오늘은 우리 집에 다시 돌아올 수 있어서 좋았다. 내 침대야!!! 오랜만이야!!! 오늘 밤에 행복하게 잘 수 있다. It was not a good day to start with. I was once again starting to entertain useless and senseless thoughts. I guess I’m still not entirely okay because every little not-so-good thing can trigger depressing thoughts and the moment it’s been triggered it just won’t stop. Good thing, before the day ends, I get to meet Angeli and being with her made me really happy! I’ve known her from this blog but since she lives far from where I live we haven’t met. The first time I saw her was at KCC – the testing center for the last TOPIK exam. I’m so glad she approached me because I might have not recognized her if she didn”t. We didn’t get to talk much before and after the exam. I’m glad she agreed to meet me this day. Even if it was technically the first time we sat down and talk with each other in person it doesn’t feel, in any way, the first time we’re seeing each other. We talked and talked and talked and talked until it’s almost midnight. 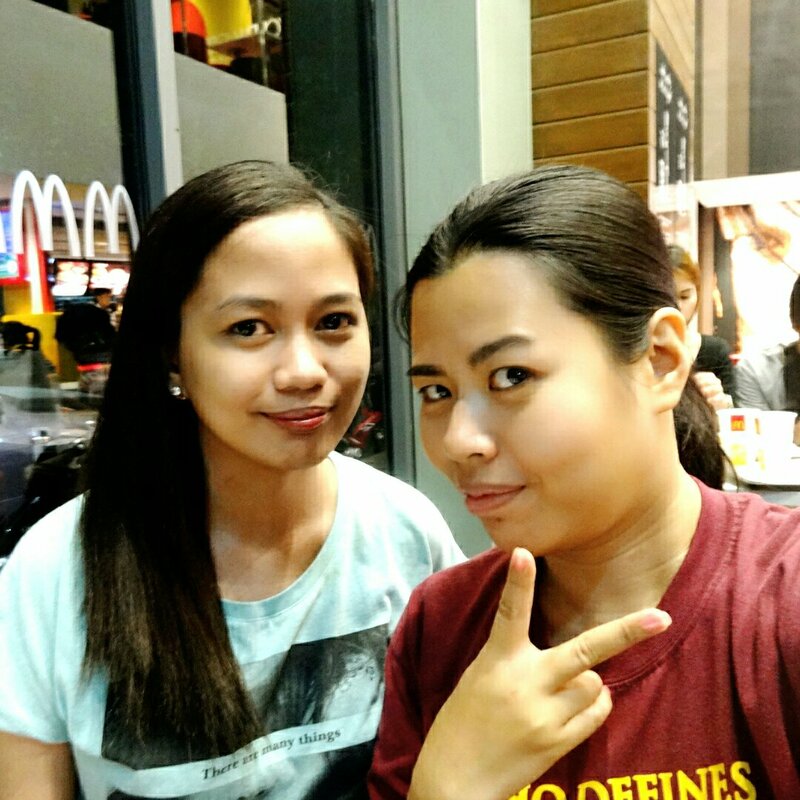 We talked mostly about Korean – the TOPIK exam, learning Korean, blogging, other bloggers (ehem), Korea, fangirling, books, etc etc. It was really fun and if only we both don’t have to go home that day we can probably stay up until morning talking. *Meloncreme, I’m stealing this photo! The ones I took weren’t as good.